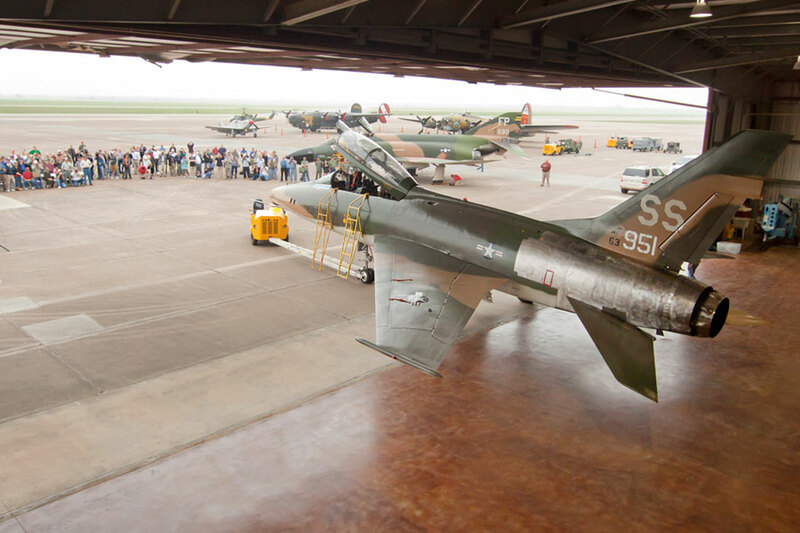 The Collings Foundation's F-100F and Colonel George "Bud" Day Celebration Flight. A top speed in excess of 800 mph. Made by North American, this particular F-100F serial #56-3844 (“844”) was delivered to the United States Air Force in November of 1957. 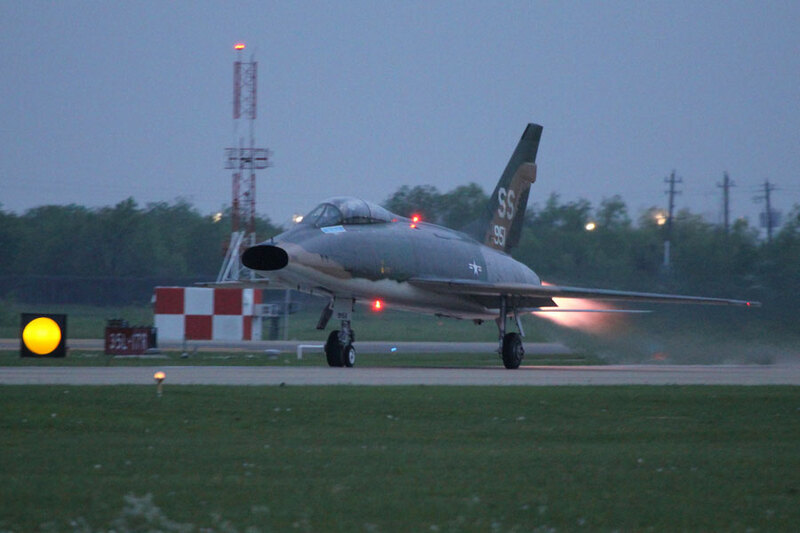 From 1958 to October 1970 this Super Sabre was assigned to the 20th TAC Fighter Wing. During that time, the aircraft was based primarily in the U.K. with deployments to Libya and Turkey. 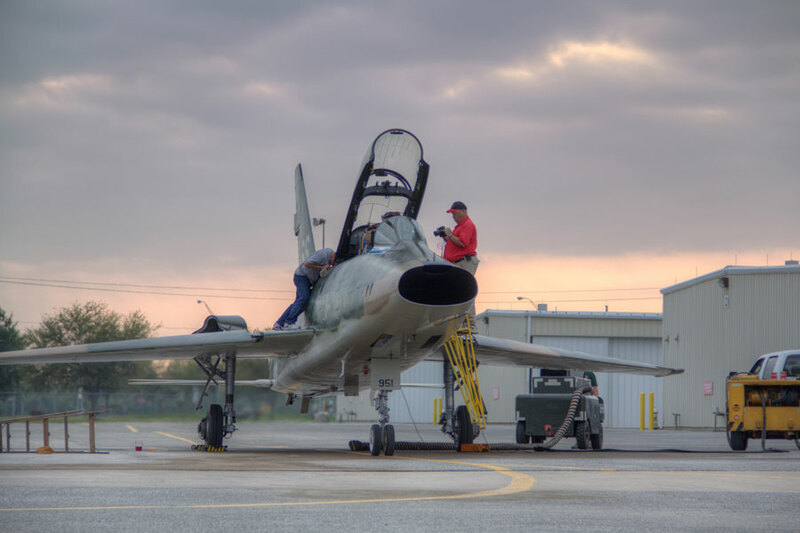 “844” was returned to the United States in 1971 where it was assigned to the 149th Tactical Fighter Group (TX Air National Guard), based at Kelly AFB, San Antonio, Texas. The aircraft was dropped from USAF service in 1974. After a short time in storage “844” was transferred to the Danish Air Force where it served until 1981. In 1982, it was transferred to Flight Systems Inc. under civilian registrations and flew in the United Kingdom and Italy from 1983 to 1992. “844” transferred to Grecoair Inc. in El Paso, Texas, from 1997 to 2011 painted in New Mexico Air Guard and then Thuderbird markings. North American named the initial design proposal of the aircraft the Sabre 45, because of the 45 degree wing sweep similar to the F-86 Sabre. The Super Sabre had four model variants: F-100A, F-100C, F-100D and F-100F. Pratt & Whitney J57-P-7 engine powered early models. Later models were powered by the Pratt & Whitney J57-P21A engine. Both engines were able to produce well over 10,000 pounds of thrust. 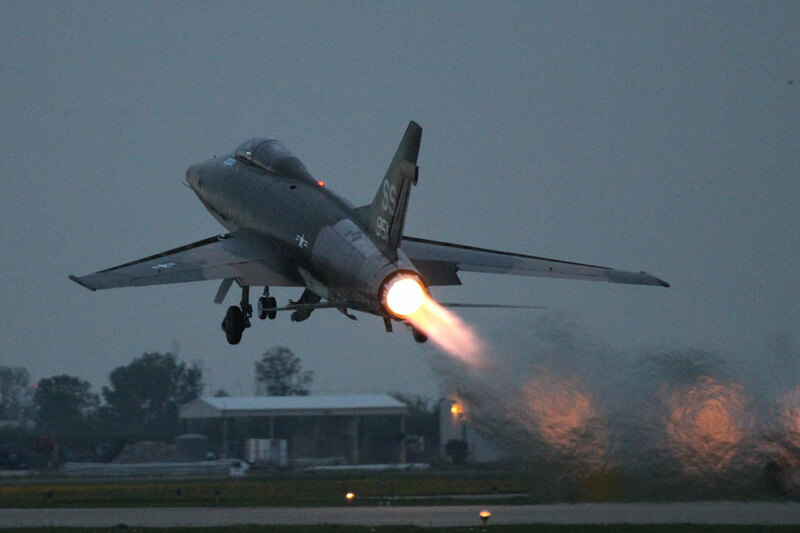 The F-100 flew extensively over South Vietnam as the Air Force’s primary close air support until replaced by the A-7 Corsair II. 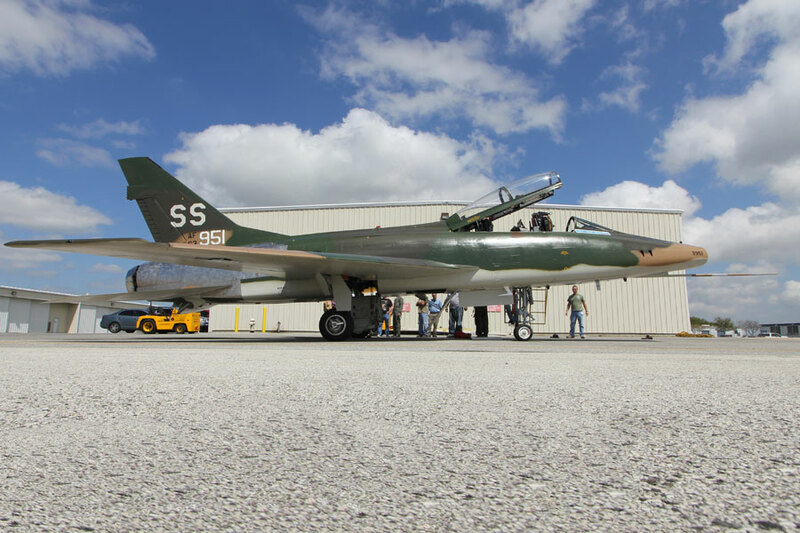 The F-100’s were the longest serving US fighter-bomber to fight in the war. The Super Sabres served as escorts to F-105 Thunderchiefs, MIGCAP, MISTY FACs and “Wild Weasels” over North Vietnam. 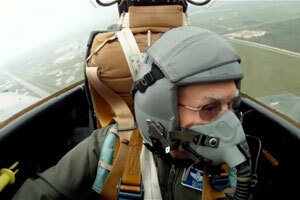 The Super Sabre had the first confirmed kill during the war when Capt. Donald Kilgus shot down a Mig-17 using cannon fire. 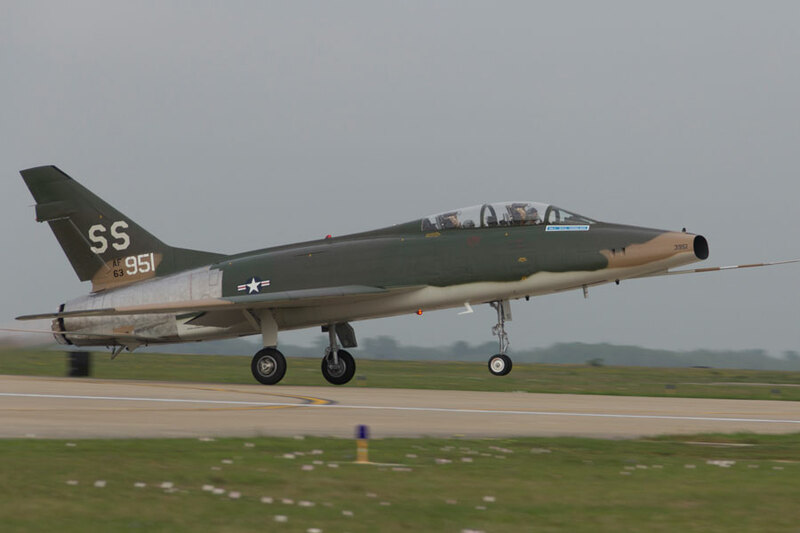 The F-100F is a two-seat model that saw service as a “Fast FAC” or Misty FAC (forward air controller). 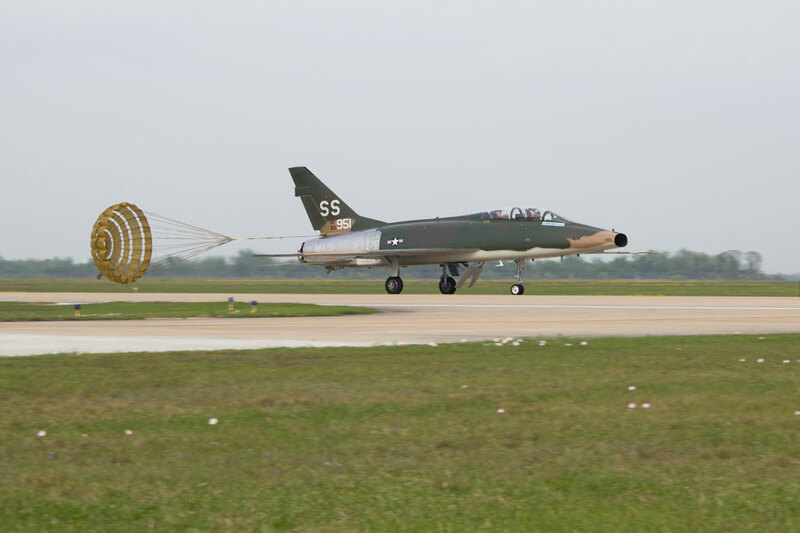 The F-100F would conduct dangerous low-level missions to spot targets for other fighter-bombers, reconnaissance, SAR (search and rescue) and was the first “Wild Weasel” SEAD (suppression of enemy air defenses) aircraft. The “Hun” logged over 360,000 combat sorties during the Vietnam War until operations ended in 1971. 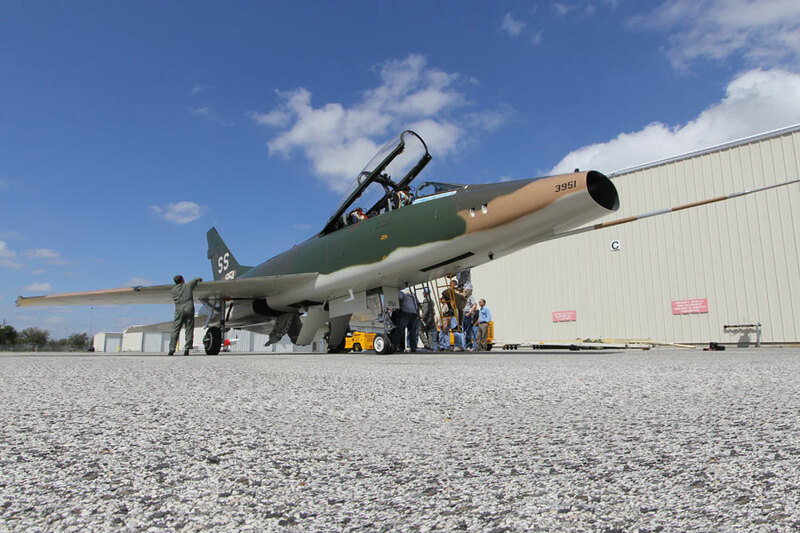 The Foundation’s F-100F #56-3844 was painted in honor of Medal of Honor and Air Force Cross recipient Col. George “Bud” Day’s original F-100 that carried the name “MISTY 1.” Col. Day is the most decorated officer in the history of the Air Force and most decorated American since General McArthur.